It seems to be flower arranging season for some of us. 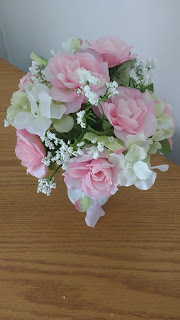 We are in the last days of the snow, rain and cold wind, so arranging indoor flowers is so delightful. Above, you see three stems of florals from Walmart for 97 cents each. There are 6 stems on each bush. Sometimes in a catalog I receive in the mail, there are beautiful life-like florals for a $100 in resin, which is a water-look hard plastic. This is one of them, below from Victorian Trading. If anyone can afford to pay this and has a beautiful hotel or house to decorate, I say congratulations, and I'm all for it! Anything to make an elegant home. For some of us who can spend a few dollars, I've tried to make a similar one. 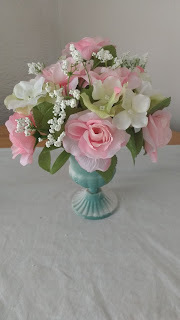 I gathered some things from my Dollar Tree collection (I use the same flowers and styrofoam from previous arrangements because I never use glue in the containers or with the stems in the styrofoam), and tried to make one like the picture. All the stems are clipped with a wire cutter, and the leaves pushed up close to the blossoms. 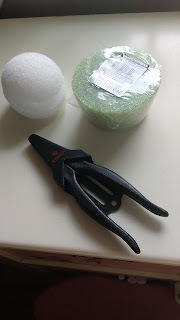 I used the tin pedestal on the left and inserted a styrofoam ball from Dollar Tree (4 in a package for a dollar) to hold the wire stems. This amounts to 18 flowers from 3 bushes, which makes a nice full bouquet. 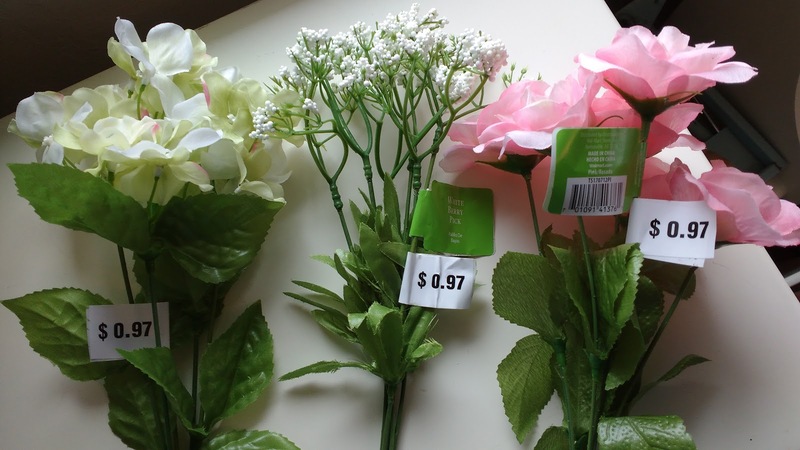 The total cost was $3.00 for this bouquet. 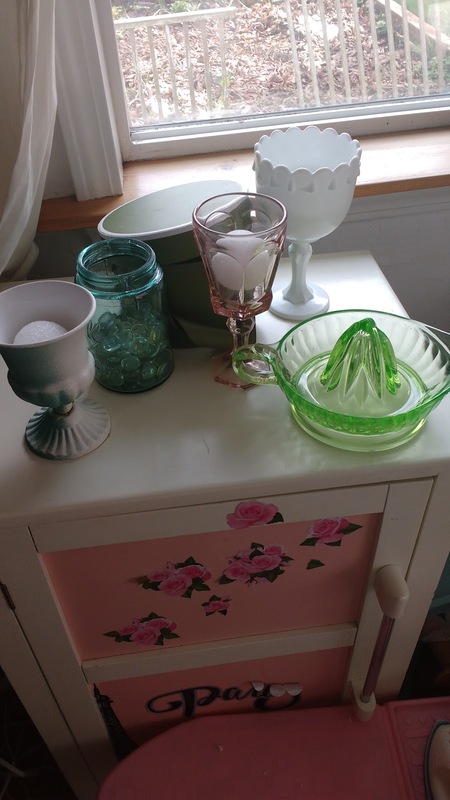 You may notice I have painted the container sage green. I can remove all the ingredients, put them back in the storage box, to be used again. 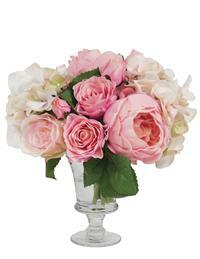 There are tutorials online to show you how to place flowers for different arrangements. For a beginner, I would suggest three flowers, with one in the middle and one on each side. Then start filling in the spaces with other flowers. You can make it interesting by using different textures and types as accents. I have the ingredients for a bolder, brighter bouquet which I hope to do tomorrow. Each day I try to take a little time and do one creative thing, even if it is only to arrange some books or pouf some cushions on the couch, and I hope you can find something like this for your own home. Lord willing, I hope to make another video for you to work by, soon. Your comments are so encouraging. Also, a few other places have sales on their *prettier* flowers during certain times as I rotate my route during the seasons. That came out very nice. They do make silk flower better these days. They look more natural. Nice job arranging. I do something similar around my home. Sometimes I like a simple large slim vase with some sprigs of cherry blossom or Forsythia in it. Happy spring! Interesting fact. 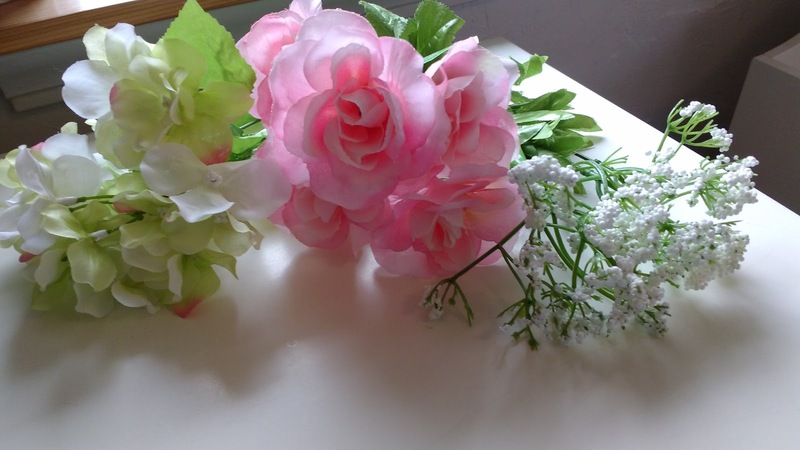 In Japan flower arranging is considered an art, and a sign of femininity in women. Just as pretty as the expensive one without the heartache of the big price tag. You are very creative and talented!. Thank you ladies. 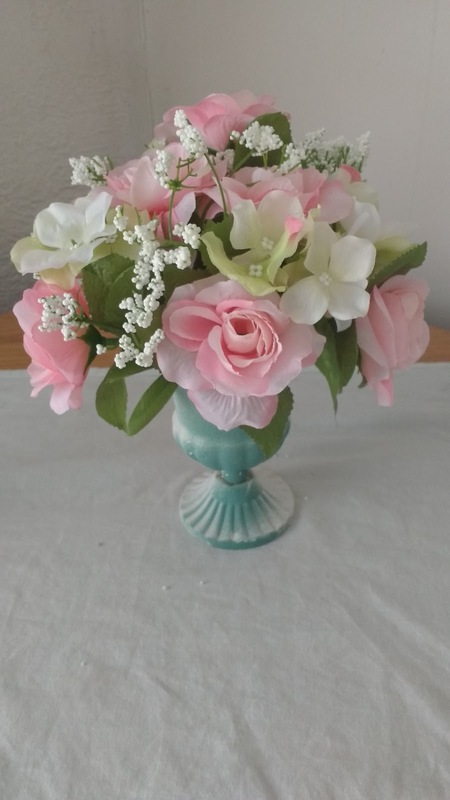 I find flower arranging more relaxing than sewing! Fog Fashion--Sewing for Foggy Days!